The idea of supersmellers is a popular one. Novelists are particularly taken with characters who have an extraordinary ability to detect and identify odors. Patrick Süskind’s nasty little novel Perfume: The Story of a Murderer is a prime example. The story’s creepy anti-hero Grenouille can pick up scents at great distance and describe their components with uncanny precision. This idiot-savant of perfumery fetishizes the smell of virgin women; when he seeks to extract their bodily essences he becomes a serial killer. Other literary supersmellers, such as Saleem Sinai in Salmon Rushdie’s Midnight’s Children, are less macabre. Some, like the characters in Tom Robbins’s Jitterbug Perfume, are downright comic. Despite their frequent appearance in literature, I don’t know of a single documented case of a real-life smell genius. Sure, some people have very sensitive noses. Others have a flair for creating pleasing combinations of scent. But professional perfumers have ordinary noses. When they encounter a new perfume they smell it from the top down. They recognize a general type—a chypre for example—look for a distinguishing twist and only then search for specific notes that make it unique. In other words, a perfumer smells the forest, not the trees. In contrast, fictional characters like Grenouille turn psychological reality upside down: they recognize individual flowers before noticing the bouquet. Their abilities aren’t an exaggeration of normal smelling—they’re a contradiction of it. When I gave a talk at the Barnes & Noble in Greenwich Village a while back, an older gentleman had me sign his copy of What the Nose Knows. He wore oversized glasses, was poorly shaved, and his shirt pocket was stuffed with pens, scraps of note paper, bus schedules, and betting slips from Aqueduct. A classic Village oddball. As I handed back his book, he asked me if I was familiar with Edgar Rice Burroughs. I was. Did I know that Tarzan of the Apes had an extraordinary sense of smell? I did not. Despite appearances, something told me this geezer knew what he was talking about. Though the spoor was two days old, and practically obliterated in many places, Tarzan followed it with comparative ease. A white man could not have followed it twenty paces twelve hours after it had been made, a black man would have lost it within the first mile; but Tarzan of the Apes had been forced in childhood to develop senses that an ordinary mortal scare ever uses. We may note the garlic and whiskey on the breath of a fellow strap hanger, or the cheap perfume emanating from the person of the wondrous lady sitting in front of us, and deplore the fact of our sensitive noses; but, as a matter of fact, we cannot smell at all, our olfactory organs are practically atrophied, by comparison with the development of the sense among the beasts of the wild. Like many of his generation, Burroughs the armchair Darwinian casually incorporated spurious ideas of racial gradation into his evolutionizing. He also subscribed to the popular view that the human sense of smell has devolved through disuse—a misconception he shared with Sigmund Freud and the pioneer sexologist Havelock Ellis. Freud thought that only children and neurotics paid attention to smell and that healthy adults grew out of it. Ellis believed that smell had long ago given way to vision. 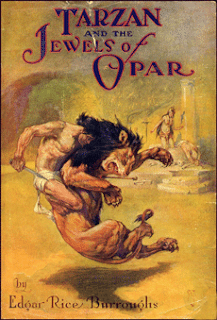 For Edgar Rice Burroughs, however, biology was not destiny. Raised as an ape, even Tarzan’s feeble human nose became capable of great things.